An aerosol is a suspension of fine solid particles or liquid droplets, in air or another gas. Aerosols can be natural or anthropogenic. Examples of natural aerosols are fog, dust, forest exudates and geyser steam. Examples of anthropogenic aerosols are haze, particulate air pollutants and smoke. The liquid or solid particles have diameters typically <1 μm; larger particles with a significant settling speed make the mixture a suspension, but the distinction is not clear-cut. In general conversation, aerosol usually refers to an aerosol spray that delivers a consumer product from a can or similar container. Other technological applications of aerosols include dispersal of pesticides, medical treatment of respiratory illnesses, and convincing technology. Diseases can also spread by means of small droplets in the breath, also called aerosols. Airborne diseases can also affect non-humans. For example, Newcastle disease is an avian disease that affects many types of domestic poultry worldwide which is transmitted via airborne contamination. Often, airborne pathogens or allergens cause inflammation in the nose, throat, sinuses, and the upper airway lungs. Upper airway inflammation causes coughing congestion, and sore throat. This is caused by the inhalation of these pathogens that affect a person's respiratory system or even the rest of the body. Sinus congestion, coughing and sore throats are examples of inflammation of the upper respiratory air way due to these airborne agents. Climate and living area. Rainfall (number of rainy days  being more important than total precipitation   ), mean of sunshine daily hours,  latitude, altitude  are characteristic agents to take in account when assessing the possibility of spread of any airborne infection. Furthermore, some infrequent or exceptional extreme events also influence the dissemination of airborne diseases, as tropical storms, hurricanes, typhoons, or monsoons. Climate conditions determine temperature, winds and relative humidity in any territory, either all year around or at isolated moments (days or weeks). Those are the main factors affecting the spread, duration and infectiousness of droplets containing infectious particles. For instance, influenza virus, is spread easily in northern countries (north hemisphere), because of climate conditions which favour the infectiousness of the virus but on the other hand, in those countries, lots of bacterial infections cannot spread outdoor most of the year, keeping in a latent stage. Nearness to large sources of water as rivers and lakes can be a cause of some outbreaks of airborne diseases, after changes in local watershed. Poor sewage systems are usually found in poor countries, especially in the rural areas, and can determine the proliferation of infectious bacteria, that once infecting animal or humans can be transmitted throughout the air. Pharyngitis is inflammation of the back of the throat, known as the pharynx. It typically results in a sore throat and fever. Other symptoms may include a runny nose, cough, headache, and a hoarse voice. Symptoms usually last 3-5 days. Complications can include sinusitis and acute otitis media. Pharyngitis is a type of upper respiratory tract infection. Kennel cough is an upper respiratory infection affecting dogs. There are multiple causative agents, the most common being the bacterium Bordetella bronchiseptica, followed by canine parainfluenza virus, and to a lesser extent canine coronavirus. It is highly contagious; however adult dogs may display immunity to reinfection even under constant exposure. Kennel cough is so named because the infection can spread quickly among dogs in the close quarters of a kennel or animal shelter. 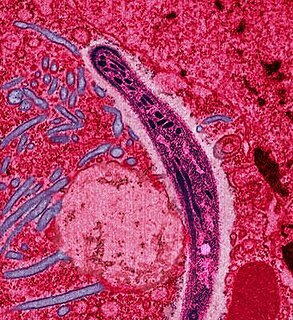 Cryptosporidium is a genus of apicomplexan parasitic alveolates that can cause a respiratory and gastrointestinal illness (cryptosporidiosis) that primarily involves watery diarrhea with or without a persistent cough in both immunocompetent and immunodeficient humans. 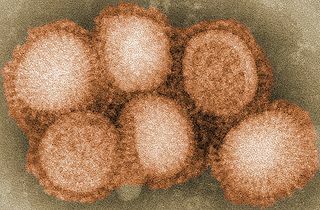 H3N8 is a subtype of the species Influenza A virus that is endemic in birds, horses and dogs. In 2011, it was reported to have been found in seals. Cats have been experimentally infected with the virus, leading to clinical signs, shedding of the virus, and infection of other cats. Aerosolization is the process or act of converting some physical substance into the form of particles small and light enough to be carried on the air i.e. into an aerosol. Mycoplasma gallisepticum (MG) is a bacterium belonging to the class Mollicutes and the family Mycoplasmataceae. It is the causative agent of chronic respiratory disease (CRD) in chickens and infectious sinusitis in turkeys, chickens, game birds, pigeons, and passerine birds of all ages. 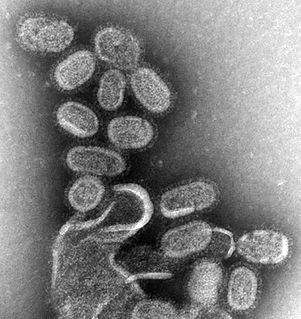 Influenza prevention involves taking steps that one can use to decrease their chances of contracting flu viruses, such as the Pandemic H1N1/09 virus, responsible for the 2009 flu pandemic. Transmission-based precautions are additional infection-control precautions in health care, and the latest routine infection prevention and control practices applied for patients who are known or suspected to be infected or colonized with infectious agents, including certain epidemiologically important pathogens. The latter require additional control measures to effectively prevent transmission. A number of possible health hazards of air travel have been investigated. ↑ "Airborne diseases". Archived from the original on 28 June 2012. Retrieved 21 May 2013. ↑ Mitchell, Bailey W.; King, Daniel J. (October–December 1994). "Effect of Negative Air Ionization on Airborne Transmission of Newcastle Disease Virus". Avian Diseases. 38 (4): 725–732. doi:10.2307/1592107. JSTOR 1592107. ↑ Siegel JD, Rhinehart E, Jackson M, Chiarello L, Healthcare Infection Control Practices Advisory Committee. "2007 Guideline for Isolation Precautions: Preventing Transmission of Infectious Agents in Healthcare Settings" (PDF). CDC. Retrieved 2019-02-07. 1 2 Pica N, Bouvier NM (2012). "Environmental Factors Affecting the Transmission of Respiratory Viruses". Curr Opin Virol. 2 (1): 90–5. doi:10.1016/j.coviro.2011.12.003. PMC 3311988 . PMID 22440971. 1 2 Rodríguez-Rajo FJ, Iglesias I, Jato V (2005). "Variation assessment of airborne Alternaria and Cladosporium spores at different bioclimatical conditions". Mycol Res. 109 (4): 497–507. CiteSeerX 10.1.1.487.177 . doi:10.1017/s0953756204001777. PMID 15912938. ↑ Peternel R, Culig J, Hrga I (2004). "Atmospheric concentrations of Cladosporium spp. and Alternaria spp. spores in Zagreb (Croatia) and effects of some meteorological factors". Ann Agric Environ Med. 11 (2): 303–7. PMID 15627341. ↑ Sabariego S, Díaz de la Guardia C, Alba F (May 2000). "The effect of meteorological factors on the daily variation of airborne fungal spores in Granada (southern Spain)". Int J Biometeorol. 44 (1): 1–5. doi:10.1007/s004840050131. PMID 10879421. 1 2 Hedlund C, Blomstedt Y, Schumann B (2014). "Association of climatic factors with infectious diseases in the Arctic and subarctic region – a systematic review". Glob Health Action. 7: 24161. doi:10.3402/gha.v7.24161. PMC 4079933 . PMID 24990685. 1 2 Tang JW (2009). "The effect of environmental parameters on the survival of airborne infectious agents". J R Soc Interface. 6 Suppl 6: S737–46. doi:10.1098/rsif.2009.0227.focus. PMC 2843949 . PMID 19773291. ↑ Khan NN, Wilson BL (2003). "An environmental assessment of mold concentrations and potential mycotoxin exposures in the greater Southeast Texas area". J Environ Sci Health a Tox Hazard Subst Environ Eng. 38 (12): 2759–72. doi:10.1081/ESE-120025829. PMID 14672314. ↑ Fernstrom A, Goldblatt M (2013). "Aerobiology and its role in the transmission of infectious diseases". J Pathog. 2013: 493960. doi:10.1155/2013/493960. PMC 3556854 . PMID 23365758. ↑ "Aerosolization 's Roll in Transmission of Healthcare Acquired Conditions". Archived from the original on 9 June 2015. Retrieved 12 April 2015. ↑ "Legionnaire disease" . Retrieved 12 April 2015. 1 2 American Academy of Orthopaedic Surgeons (AAOS) (2011). Bloodborne and Airborne Pathogens. Jones & Barlett Publishers. p. 2. ISBN 9781449668273 . Retrieved 21 May 2013. ↑ Laura Ester Ziady; Nico Small (2006). Prevent and Control Infection: Application Made Easy. Juta and Company Ltd. pp. 119–120. ISBN 9780702167904 . Retrieved 21 May 2013. ↑ "Redirect - Vaccines: VPD-VAC/VPD menu page". 2019-02-07. ↑ "Chamber Test Analysis on Eco-RX Inc. Model 400 Air Purifier" (PDF). Retrieved 4 May 2007. ↑ Glass RJ, Glass LM, Beyeler WE, Min HJ (November 2006). "Targeted social distancing design for pandemic influenza". Emerging Infect. Dis. 12 (11): 1671–81. doi:10.3201/eid1211.060255. PMC 3372334 . PMID 17283616.